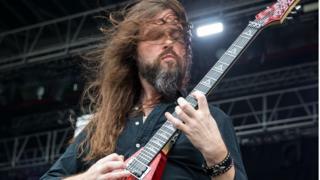 Oli Herbert, the guitarist of US metal band All That Remains, has died suddenly at the age of 44. The news of Herbert’s death was announced on social media on the US group’s Instagram account. In the post the band, best known for such songs as Two Weeks and What if I was Nothing, said they were “devastated” by the loss of one of their founding members. The cause of Herbert’s death is not yet known. “Oli was an incredibly talented guitarist and song writer who defined Rock and Metal from the Northeast [of America],” the statement continued. The Massachusetts quintet formed in 1998 and released their debut album, Behind Silence and Solitude, in 2002. Herbert has appeared on all of their nine studio albums, including Victim of the New Disease, to be released in November. Herbert’s wife Beth, who was married to the guitarist for 14 years, posted a message on Facebook saying the circumstances surrounding Herbert’s death were unclear. “Thank you all for the kind thoughts and words. I don’t want to go into what happened until we have a complete picture,” she wrote. Among the musicians to pay tribute to the guitarist is Arch Enemy’s Michael Amott, who said he was “shocked” to learn of Herbert’s death. Cristina Scabbia, from Italian metal band Lacuna Coil, also expressed sadness at his passing. US rock show host Lou Brutus said Herbert was a “tremendous musician” and a “phenomenal guy”. The band is scheduled to come to the UK in December to perform six dates as part of a European tour.